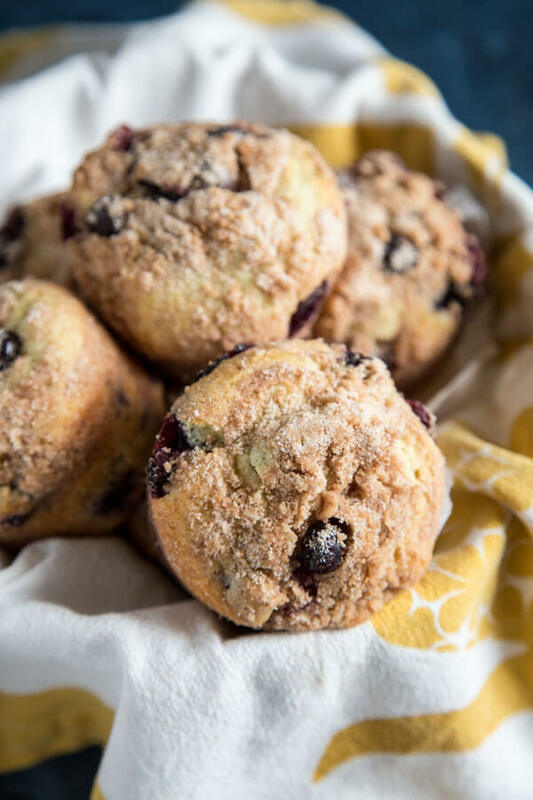 These Buttermilk Blueberry Muffins are soft and fluffy, bursting with delicious blueberries and topped with a buttery cinnamon streusel. They are perfect for breakfast but they may disappear right out of the oven no matter the time of day. My first memory of Blueberry Muffins is from Claim Jumper’s display case at the restaurant entrance. 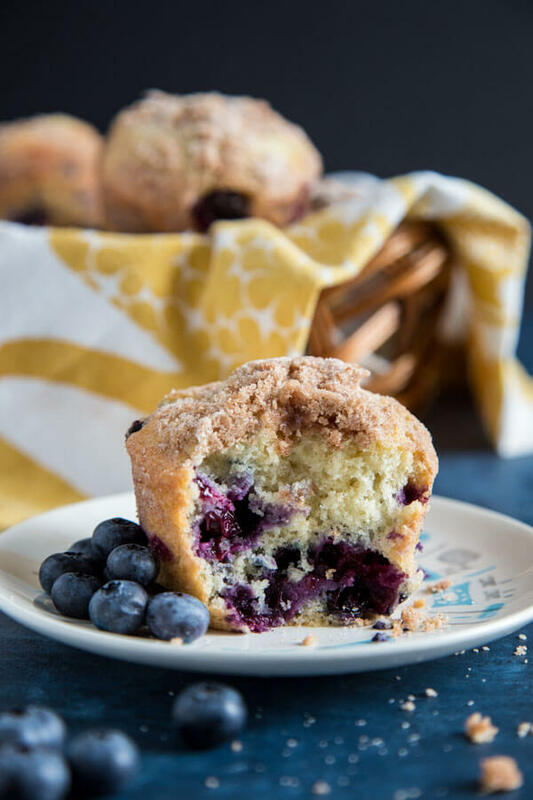 Jumbo muffins with generous muffin top and blueberries peaking out of the soft cake, and that crunchy streusel was just like frosting on the cake. My go to meal used to be Tri-Tip with baked sweet potato and a side of blueberry muffin. Then at my very first job out of college, a coworker brought in blueberry muffins made with her mom’s recipe, I was hooked. I needed blueberry muffins, a serious need that can only be solved by rolling up some sleeves, creaming some butter and beating some eggs. 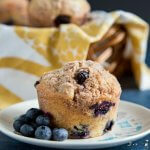 And that’s why these Buttermilk Blueberry Muffins were created. How to make cinnamon streusel? The cinnamon streusel is an extremely important part of this recipe. It is made with flour, sugar, cinnamon and cold butter. 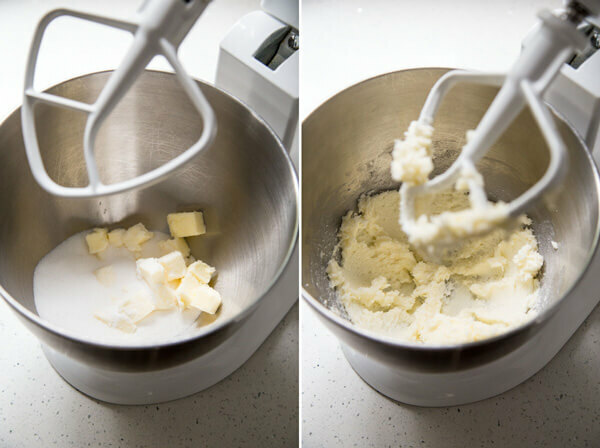 You can use a fork or Pastry Blender to cut the butter into the flour mixture to create coarse crumbs that will be your streusel mixture. This can be made a head of time and kept refrigerated or just before you start baking. If the kitchen is warm, keep the streusel refrigerated so it doesn’t melt. 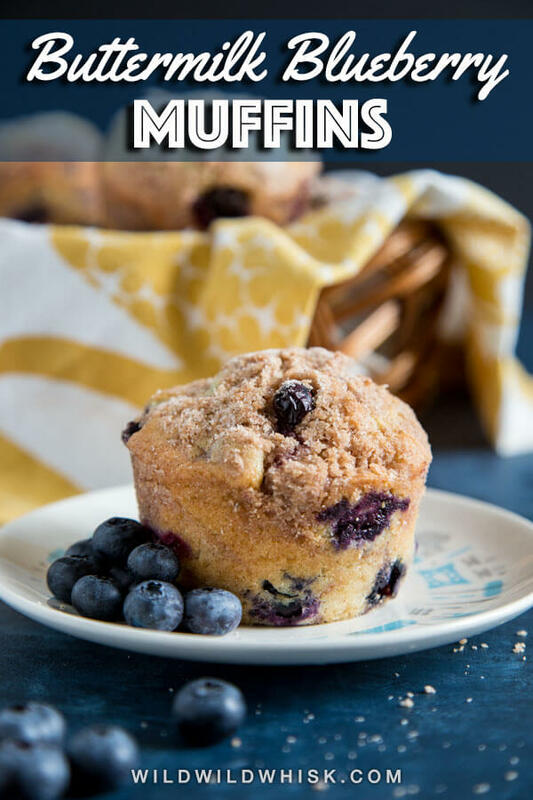 How to keep the blueberries from sinking to the bottom of the muffins? Tossing the blueberries that you will add to the batter with some flour will help suspend them in the batter so they don’t all sink to the bottom. 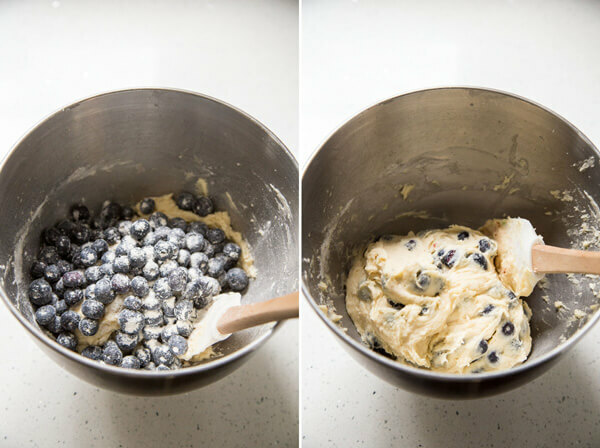 But another trick is to save about 1/2 cup to add to the top of the batter before baking to recreate that blueberry-peaking-out-of-the-cake effect. This recipe calls for creaming butter with sugar, and then adding buttermilk and egg. It is best to allow all the refrigerated ingredients to come to room temperature before mixing. This will ensure they combine smoothly. 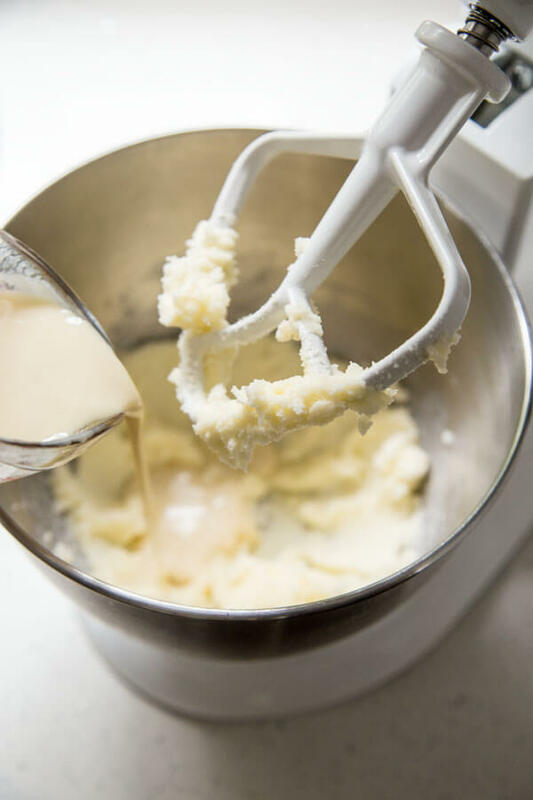 If the egg and milk are still cold, adding that to the creamed butter will re-solidify the butter and make the mixture look curdle. If this happens, don’t worry too much, keep mixing and adding a bit of flour to smooth it out. When mixing the blueberries into the batter, use a silicone spatula and fold with a light hand to avoid breaking up the ripe blueberries. Do not mix it with the stand mixer. When the batter is ready for the oven, divide it with a Large Ice Cream/Cookie Scoop into the muffin pan. Sprinkle streusel on top generously, and dot some extra blueberries on top. Be sure to butter and flour your muffin pan to ensure easy release of the muffins once baked. I find that butter and flour will always do the trick while cooking spray could be hit or miss. You could also bake these with jumbo muffin liners or make your own liners using parchment paper, like in this raspberry white chocolate chip muffin recipe. These are best served warm. They will keep for 2-3 days in an airtight container at room temperature. If the weather is warm, or if you need to store them for longer, it is best to refrigerate them. 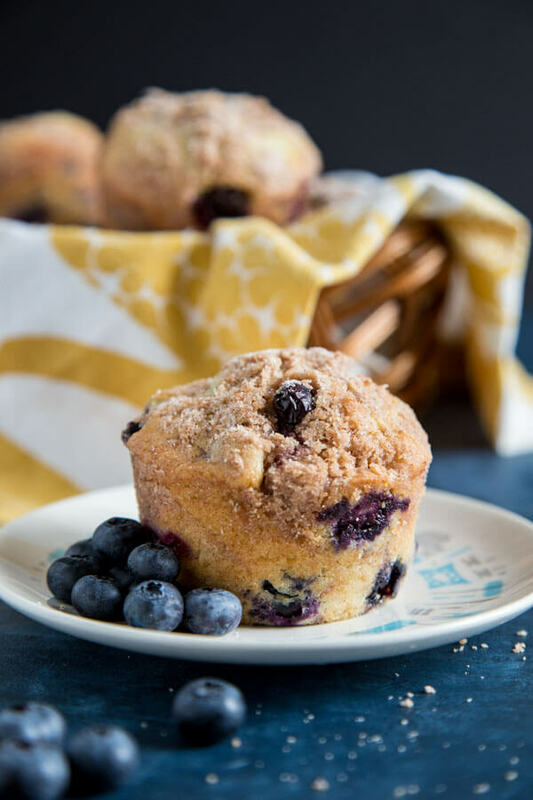 To reheat, wrap the muffin in a damp paper towel or place it on a plate and drape the paper towel over it, microwave for 15 seconds. Enjoy! Add sugar, flour and cinnamon in a small mixing bowl and stir together with a whisk to distribute evenly. Toss in the cold cubed butter and cut with a pastry blender or a fork until the texture is sandy. Refrigerate until ready to use. Brush a 6-cavity jumbo muffin pan with some melted butter and sprinkle 1 tablespoon of flour over it to cover the surfaces of the cups completely. Tap out any excess if necessary. Wash and dry the blueberries slightly. 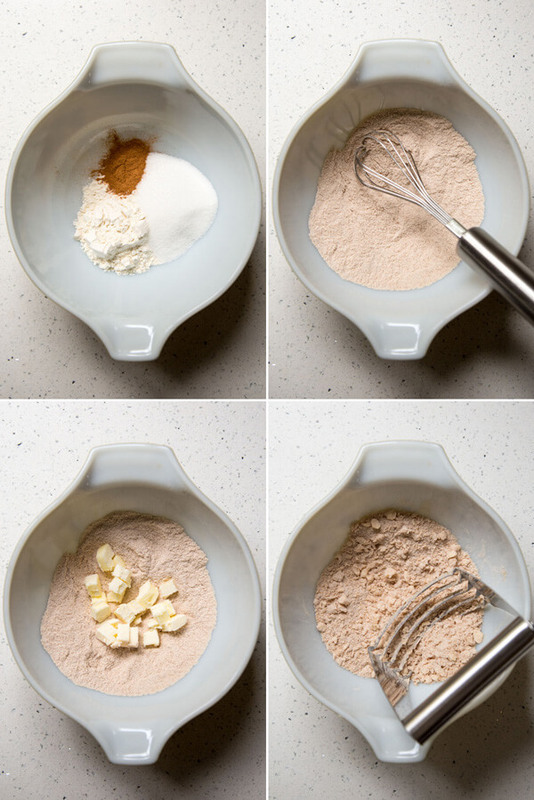 Add 1 1/2 cup to a small mixing bowl and toss with 1 tablespoon of flour. Set the other 1/2 cup of blueberry aside. 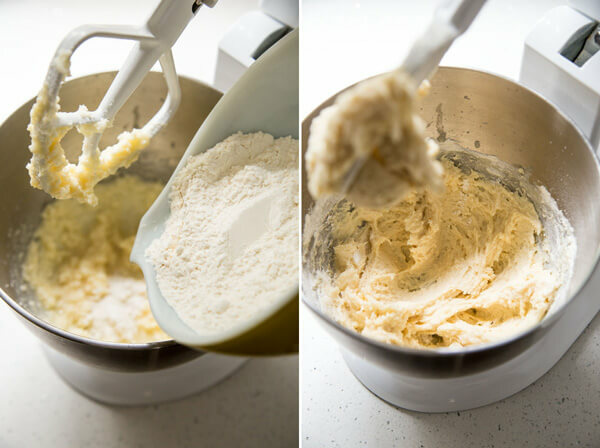 Add the remaining flour to a medium mixing bowl along with salt, baking powder, baking soda and stir together with a whisk to distribute evenly. Set aside. In the stand mixer bowl fitted with the paddle attachment, cream softened butter and sugar together until light and fluffy. Lightly beat the egg together with buttermilk and vanilla in a measuring cup, pour the mixture in with the butter. Beat to incorporate. With the mixer on the lowest speed, slowly pour in the flour mixture and mix until just combined. 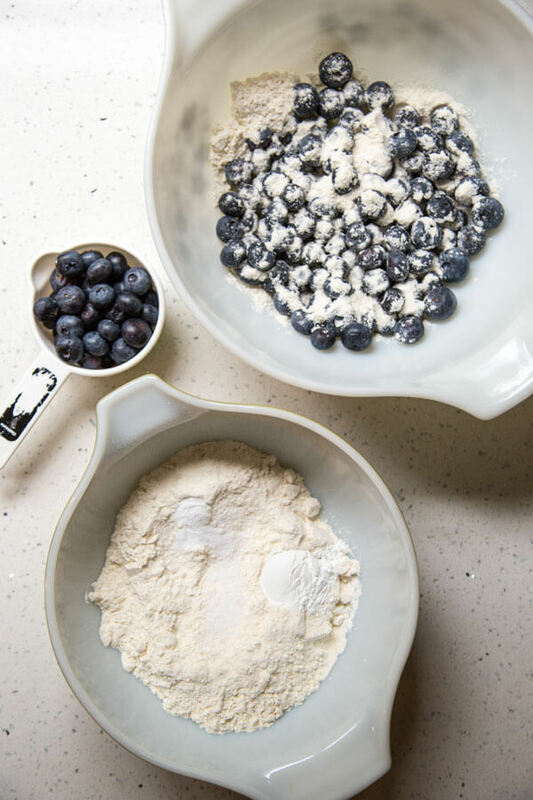 Add the blueberries that have been mixed with flour to the batter and lightly fold with a spatula until all the berries are evenly distributed. 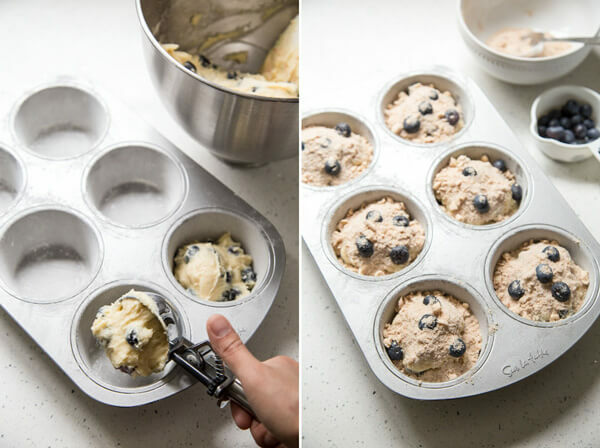 Use a large ice cream scoop to divide the batter evenly among 6 cups of the prepared muffin pan. 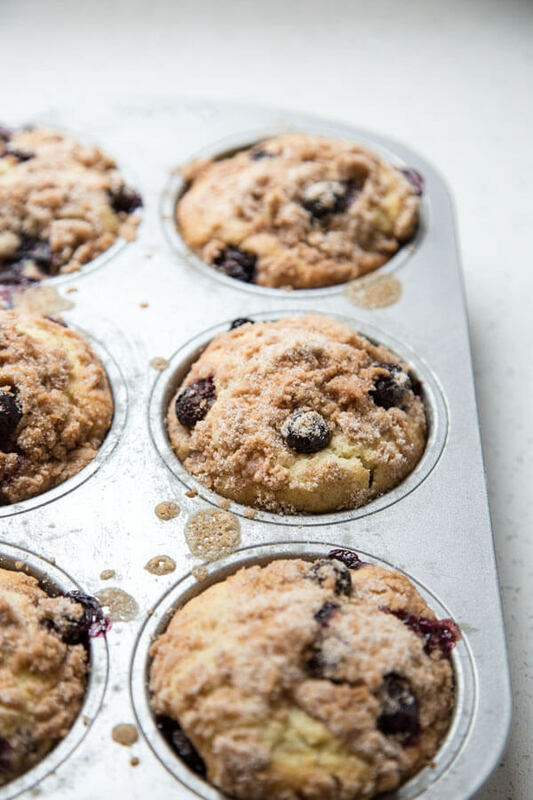 Top each muffin with about 1 1/2 tablespoon of cinnamon streusel, and add a few extra blueberries set aside earlier over the top. Bake for 28 minutes in the middle of the oven until an inserted toothpick comes out clean. Remove from the oven and set the pan on a wire rack to cool to the touch. Remove muffins from the pan and allow to cool completely on a wire rack. Allowing all the refrigerated ingredients to come to room temperature before mixing will ensure they combine smoothly. This recipe can also be used to make 11-12 regular size muffins, reduce the oven temperature to 350°F and the baking time to approximately 20 minutes. Best serve warm. To reheat, wrap in a damp paper towel and microwave for 15 seconds. these would be great for breakfast!